Some winemakers make their wines entirely from a single grape variety whereas others prefer to mix 2 varieties – and there are many instances of producers blending 3, 4 or even more different grapes into their wines. Why the difference and which is better? a Burgundian, whose whites would be made exclusively from Chardonnay and reds from Pinot Noir would say that a single variety is best; they would argue that it produces a more focussed wine and lets the quality of the grape variety used show through. They would also, no doubt, add that it had been that way for generations in Burgundy so why change? Someone from Bordeaux or the Rhône would strongly disagree. Both regions regularly make their wines from a mix of varieties – up to 13 different ones in some Côtes du Rhône. Their view would be that blending different varieties gives a more complex wine, with the characteristics of each variety contributing to the final product. But, there’s another reason for blending in cooler climates such as Bordeaux: as an ‘insurance policy’ in case of poor weather. There, a spring frost would damage the young shoots of the early-flowering Merlot but leave the Cabernet Sauvignon untouched. On the other hand, if there is rain at harvest time, the later-ripening Cabernet Sauvignon may be the one to suffer while the Merlot will already be picked and in the winery, starting to ferment. That last comment also answers I question I hear quite often: when is the blending done when different varieties are used? Although there are a few examples of 2 varieties being fermented together (Syrah and Viognier in some parts of the Northern Rhône, for example), more usually, each variety is fermented separately immediately after harvesting and the blending is done at the end of the process. So which is better – a single variety or a blend? For me, both are equally good in their own way, but, as with so much in the wine world, it’s all down to your personal taste. Next Sunday, 18th November, the famous Hospice de Beaune wine auction will take place. It’s an event that has happened annually since 1859 with the funds raised mainly supporting the running and upkeep of the magnificent Hôtel Dieu, pictured above. The building was formerly a medieval hospital, founded in 1443 in the Burgundy town of Beaune, and is now a museum. The wine auctioned comes from vineyards donated by benefactors over the centuries, the first of which dates back to 1457. Today, the area owned by the Hospice totals around 60 hectares (150 acres), mostly planted with Pinot Noir, although there is some Chardonnay, too. 85% of the production of these vineyards is rated Premier Cru or Grand Cru. These days, the auction is organised by Christies and wines are sold by the barrel – traditional Burgundy-sized ‘pièces’, each holding 228 litres, just over 300 bottles (a fraction larger than a Bordeaux barrique). Not surprisingly for such a prestigious event, hammer prices are usually well above normal commercial levels. For example, last year’s top lot sold for 420000 euros and the entire auction of almost 800 barrels raised some 13.5 million euros (£12m, $16m). If your budget won’t stretch to bidding for one of these lots but you have a strong stomach, the weekend is still worth a visit as it is also the occasion of ‘Les Trois Glorieuses’ – 3 great feasts held in and around the town on the Saturday evening before, on the Sunday night and on the Monday lunchtime. It’s quite an occasion! It’s easy to spend a lot of money on a really good white Burgundy. Yet, Burgundy is, surely, the most complicated of all of France’s Appellations Contrôlées (ACs) and, as a result, it’s just as easy to make an expensive mistake. But, this same complexity allows you, just occasionally, to find a bargain – or as close to a bargain as is possible among the wines of this famous, much sought-after region. A bottle I opened recently falls into this category. A quick glance at the label, showing the lowest level of the Burgundy hierarchy (AC Bourgogne), suggests it might be a simple everyday drinking wine, the kind you find in every supermarket for around £10 – £12. But, look further: Olivier Leflaive is a well-respected name and the ‘Oncle Vincent’ tag looks like a special bottling, as indeed it is. A tribute to Leflaive’s uncle and mentor, the grapes for this are from vineyards in Puligny-Montrachet, one of the most sought-after villages in the Côte de Beaune, where the top wines frequently sell for £50 a bottle and upwards. This example has lovely flavours of white fruits – peach and pear – made deliciously tangy and spicy from 10 months in barrels and has great length. It’s really one of the nicest wines I’ve tasted all year. This was the 2014 vintage I bought from the Wine Society a few years back, but they now have the 2016 vintage in their list at £20 and, if it’s as good (and there’s no reason why it shouldn’t be), then it certainly is a bargain, even at that price. I’d keep it a couple of years before opening it, though. So, why label a wine as a simple generic Burgundy when the fruit comes from a top village? The explanation lies in the complexity of the Burgundy ACs I mentioned earlier. Different vineyards have different classifications – one may be Grand Cru or Premier Cru while its neighbour may just be village AC. Clearly, Leflaive has some less favoured patches, or perhaps younger vines or even grapes not needed for more expensive wines. Whichever is the truth, Oncle Vincent is certainly a wine that Burgundy lovers looking for value should seek out. When you buy your wine, do you focus on Bordeaux, Burgundy and the other traditional regions of France or, do think, as one friend of mine said, that these areas are living in the past and trading on a reputation that is no longer justified? For me, that criticism is a little harsh, but I can understand that many find wines from California or Australia are just so much more approachable and usually better value. But, I wanted to put the traditional areas to the test and so I advertised a course entitled ‘The Classic Wines of France’ at Bristol’s Stoke Lodge Centre – a good move as the day was fully booked in record time with a waiting list! No pressure then! I just had to find the wines for my eager group to taste. I wanted plenty of variety and so chose 4 wines from each of Bordeaux and Burgundy plus 2 each from the Loire and Rhône. And, when I asked the group to choose their favourites at the end of the day, the results were very close with a single vote separating the top 4 wines. Bertrand Jeannot’s steely fresh Pouilly Fumé (Wine Society, £13.50) showed the benefit of extended lees ageing, while the crisp, fragrant demi-sec Vouvray from Château de Montfort (Waitrose, £11.99) had already been a winner at a previous wine course of mine, having been chosen by those who came to the ‘Wine Rivers of Europe’ day earlier in the year. But reds from Bordeaux and Burgundy (both from the Wine Society) were close behind: Château Sénéjac is everything you’d hope a Bordeaux red would be – lovely black fruits and just a hint of tannin; the only surprise is the price: £12.95 – a reflection, I suppose, that it is only an AC Haut-Medoc and not something grander. No such bargains, sadly, from Burgundy but the group clearly thought Domaine Tollot-Beaut’s Chorey-les-Beaune justified its price tag (£23) with the typical, slightly perfumed Côtes de Beaune style of Pinot Noir coming through particularly well. So, is the reputation of these areas justified? I think the day proved conclusively yes! Provided you’re prepared to pay a little beyond every day prices, the ‘Classic’ areas of France certainly offer some delightful and very drinkable wines that really shouldn’t be ignored by any wine lover. Pinot Noir is the trickiest grape. It can make great wines or disappointingly ordinary ones. The problem is that it’s very choosy about where it grows: it generally prefers a coolish climate to show off its subtle elegance. But, too cool and it won’t ripen properly resulting in raw, green flavours. On the other hand, too warm and you get thick, jammy fruit. And don’t ask the vines to produce too many bunches or the wine will be dilute and thin. So growing – and buying – Pinot Noir wines can be a nightmare. The grape is a native of Burgundy, but the growers there only get it right some of the time; the USA turns out some fine examples, as does New Zealand. But good bottles from any of these places are generally quite pricey (£15+) and I usually avoid cheaper – sometimes even mid-priced – examples as they rarely show much Pinot character. So I must have been in a good mood (or not thinking!) as I picked up a bottle from a Tesco shelf recently. 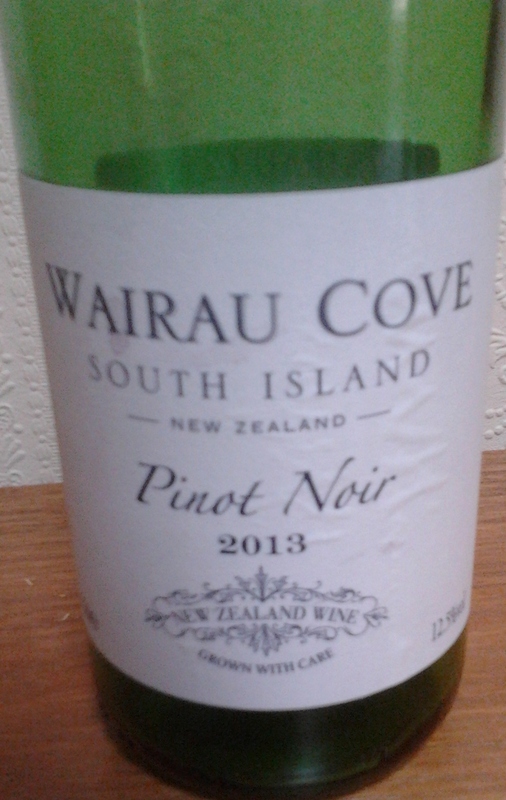 Wairau Cove Pinot Noir (£9) is described as from New Zealand’s South Island – an interesting description as I’m more used to seeing a more precise origin such as Marlborough or Nelson or Central Otago. ‘South Island’ sounds as though it might be a blend of fruit from more than one region, although the Wairau River flows through Marlborough. A clue or just a convenient Kiwi-sounding name? Whichever, the wine itself was a pleasant surprise: a typical earthy, ‘farmyard’ nose (some describe it more explicitly! ), quite light-bodied in the mouth but plenty of fruit – stewed plums and some slightly dried fruit flavours – and a reasonable finish, too. So how do Tesco do it for the price? It appears from the label that the wine may have been shipped from New Zealand in tanker and bottled here in the UK. Not what we might expect in a £9 wine, but, in this case, it’s given us a very drinkable Pinot Noir at a fair price. Nothing tricky about that! 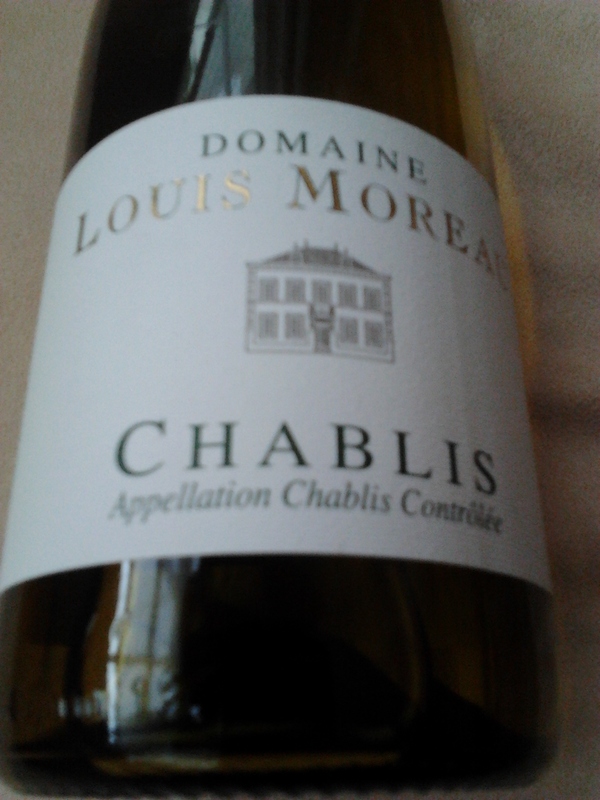 “Love Chablis; hate Chardonnay”. How many times have I heard that said – or, indeed, the reverse? It’s a comment that needs to be answered carefully because, as many Bristol Wine Blog readers will know, all wines from the Burgundy district of Chablis and claiming that designation must be made from 100% Chardonnay grapes. But it’s clear from the statement that many people buying wine don’t know that. And, in a way, their comment is understandable. Chablis is a very particular expression of Chardonnay, a grape which makes wines that vary enormously in flavour depending on where it’s grown and what happens to it in the winery. So, in a coolish climate, Chardonnay produces wines such as the Domaine Louis Moreau Chablis which we enjoyed with a friend recently – clean, fresh and minerally with attractive green apple flavours – whereas in the hottest parts of California or Australia, the much riper grapes give much fuller, richer, more alcoholic wines tasting of tropical fruits, pineapple and the like. And winemakers love working with Chardonnay as it is a good base on which they can impose their individual style and preferences, especially when it comes to using – or not using – oak. Fermenting or maturing wine in oak barrels, particularly if the barrels are new, adds a completely different dimension to the wine with spicy, nutty flavours either overlaying or replacing the natural flavours of the fruit. As a result, someone liking the delightfully refreshing 12% alcohol Chablis mentioned above might not appreciate a wine like the rich, creamy Saintsbury Chardonnay from Carneros in California (Majestic, £13.99 if you buy 2 bottles) with its subtle toasty oak character and the full flavour and weight that comes from a warmer climate and 13.5% alcohol. For me, both are good, yet, there is nothing that obviously says that they both come from the same grape variety. Given that, I can understand why some people can say they love Chablis, but hate Chardonnay – but it doesn’t make it any easier to deal with as a Wine Educator when faced with the comment!